Description: Detective Lindsay Boxer chases a jewel thief, a murderous movie star, and a killer with a vendetta against women and children. A young mother and her infant child are ruthlessly gunned down while returning to their car in the garage of a shopping mall. There are no witnesses, and Detective Lindsay Boxer is left with only one shred of evidence: a cryptic message scrawled across the windshield in blood red lipstick. Lindsay spends every waking hour working with her partner Rich—and her desire for him threatens to tear apart both her marriage and the Women's Murder Club. Before Lindsay and her friends can piece together either case, one of the killers forces Lindsay to put her own life on the line—but is it enough to save the city? 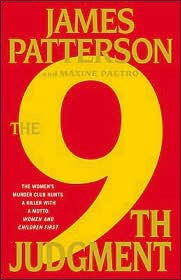 With unparalleled danger and explosive action, The 9th Judgment is James Patterson at his compelling, unstoppable best! I can call you James right, after all your books I have read, I feel we are on a first name basis. Now James, you know I love you, but lets talk about your latest novel, The 9th Judgment. For the first time I have had to put down one of your books and decide not to finish it. I know this is a first for us, so I need you to understand. James, you murdered an infant and sweetie, I just cannot seem to handle that sort of storyline. My youngest child is close in age to the infant you knocked off and that just hits too close to home. Now I AM going to forgive you for this and not treat you like I did Stephen King after being horrified while reading Pet Cemetery. I actually finished that book, but it took me 20 years to get over my disgust and pick up another one of his books, even though his book The Stand is my favorite. Instead I have decided to treat you with the same respect that I gave Joss Whedon, even though he broke my heart twice. The first time with the sudden death of Buffy's Mom by brain aneurysm (Sorry Joss, but I like Buffy came home to find my mom dead of a brain aneurysm, I CANNOT watch that episode ever again) The second time from the abrupt death of Wash, one of your most beloved characters. Joss, you made me cry, but I came back for more and James I am going to do the same for you now. Now promise me darling, no more murdering innocent children --or while we are at it no evil murdering toddlers back from the dead either. However I do approve of the killing of psychopaths or politicians -- oh never mind, that is the same thing, so keep up with that. Thanks for all your previous books, I know many people say you aren't a good writer, but don't listen to them. A good writer to me, is someone who tells a good tale and makes you not want to put a story down, well except for when you murder off innocent children of course. Received this at the Dewey Diva presentation at the Ontario Library Association Conference.